As our name suggests, Planters Unlimited offers a wide range of fully customizable planters made ultra-durable to meet the demands of commercial environments. Choose from industrial-grade materials like fiberglass, composite PVC, wood, stone, and stainless steel. Further customize your planter by selecting from 25 colors and four unique finishes, including high gloss and real metal. Oversized planters, self-watering and watertight planters, brand-centric planters with logos and other trademark designs, and planters with light and power sources are also available, and can be made in the size and style you need for your project. 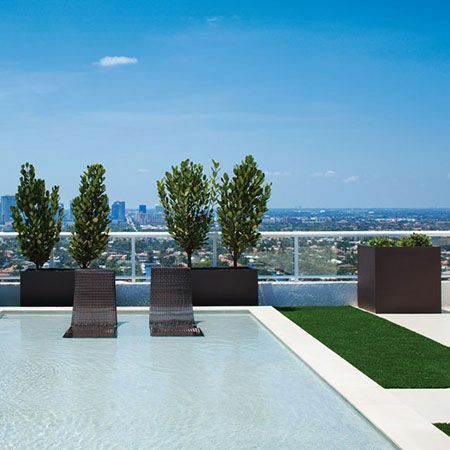 And since each of our planters are constructed with internal reinforcement for added stability and built from durable materials, they will last for years indoors or out, even in the harshest of climates and high-traffic conditions. When it comes to durability in design, heavy-duty fiberglass planters are second to none in performance. Fiberglass is marine grade and durable, yet lightweight, making fiberglass planters a smart solution for commercial projects, both indoor and out (and in all climates). The workable nature of fiberglass means endless options for creating truly custom planters—choose from a variety of styles, sizes, and color options. To further assist you, we also offer phone consultations so that we can help you customize any fiberglass planter to fit the needs of your project. Similar to fiberglass, composite PVC planters are made from a premier composite material that is both lightweight and durable. With their clean, contemporary style, our composite PVC planters can be painted to match or complement their surroundings. These planters are also rot- and fade-resistant, and effortlessly resist the decay often associated with the heavy planting loads of commercial environments. For that rustic, earthy look only natural materials can provide, a wood planter is the ideal solution. Perfect for organic gardening, health food restaurants, and other eco-friendly locales, our wood planter collection features rich cedar, redwood, and reclaimed wood. The warm appeal of a wood planter fits seamlessly on commercial patios, pool decks, day spas, mountain lodges, and rustic bed-and-breakfasts. Whether your project calls for the look and feel of cast stone or weathered stone, our planters made with these lightweight materials provide a sense of grandeur to commercial settings. At a fraction of the weight of real stone or concrete, cast and weathered stone outlasts them both, and won’t crack or chip in the interim. For a solid, sophisticated look, our stainless steel planters are offered in brushed aluminum, brass, mirrored stainless steel, hammered copper, and wrought iron. We also carry a variety of designer planters made from a mix of materials, all subject to customization too. Add some illumination for distinction or to light walkways at night. For additional information on customization of any of our planters ordered by material, please contact us about your next project.